WaveRoom Plus FDLL-2 Dispensing Bottle 2 oz. industry. 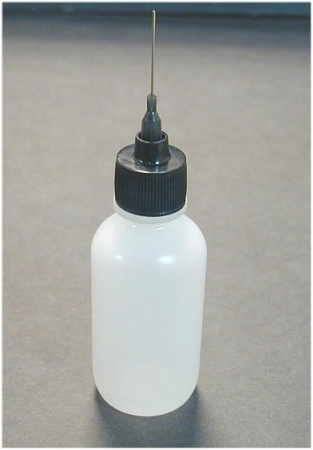 This polyethylene squeeze bottle will dispense one drop of liquid flux or solvent at a time. The screw top holds a 1” stainless steel needle. The bottle holds 2 oz’s of product that is visible through the clear plastic material. Menda 35305 Single-Touch HDPE Dispensing Bottle 4 oz. Menda 35309 Single-Touch HDPE Dispensing Bottle 6 oz. Menda 35312 Single-Touch HDPE Dispensing Bottle 8 oz. R&R Lotion SD-6-ESD Single-Touch HDPE Dispensing Bottle 6 oz.